Professional coaching is a process by which an individual or team engage their specific set of skills, knowledge and actions to achieve successful results for their relevant responsibilities under the direction and support of a qualified coach. Whether an individual or a team, a professional coach supports the goals set by the individual or team leading them to achieve successful results. Energy Leadership reaches the entire organization by developing an effective leadership quality and style to create positive change by influencing individuals, teams and leaders within the organization. The effective support, skills, and methods of a professional coach applied to the individual’s or team’s determined actions, goals and choices lead to compelling results and success. Coaching prepares the individual for achievement by focusing on their desired future and the path they are willing to take to get there. Individuals and teams develop more effective decision-making by achieving a greater focus of the possibilities surrounding each choice they make. Most coaching strategies strive to achieve greater success, momentum and capacity by increased individual execution, ability and discovery of untapped strengths. Uniquely, Executive Coaching produces quality executives and business owners by addressing their specific needs both personally and corporately through obtaining a clear focus on corporate and personal goals, visions and values. Encouraging coaches and mentors are a common denominator amongst the most successful owners, executives, managers and individuals. The unbiased support, feedback and advice of a neutral coach inspires confidence and sound decision making when faced with obstacles or hardship. Participating in a coaching relationship yields personal enhancements and fresh perspectives when faced with challenges and opportunities. By developing personal decision-making and interpersonal skills, individuals gain confidences resulting increased productivity, life and cooperate satisfaction and marked achievement for personal goals. experience leading to an increased rate of personal and professional growth. Learn from Personal Experiences. Top performers regularly seek out the advice and counsel of a coach to support their learning experience at all levels of their life. Develop Heightened Self-Awareness. Through implementation of well-planned personal processes, coaches can assist executives in gaining the most of their coaching experience by focusing on what is, not on what should be. Establish Personally Relevant Learning Goals. 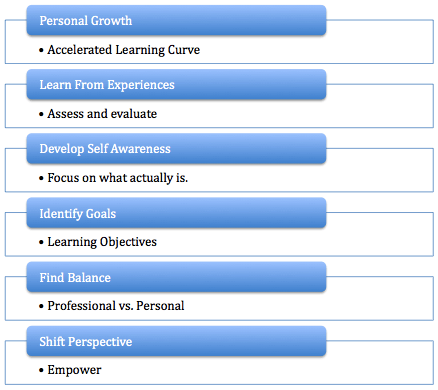 Identifying personal learning goals is enhanced with the support of a qualified coach for executives and individuals. Balance the Demands and Needs of Others. Coaching provides individuals and executives assistance to develop an effective balance between professional and personal needs. Proper prioritization of commitments, goals, projects and obligations lowers stress and allows personal fulfillment from both work and personal responsibilities. Empower by Shifting Perspective. Like a growing cobweb of personal experiences we develop a web of assumptions, beliefs, expectations, morals, and opinions about our lives, personal experiences and work. Often external influences are the most effective way to reevaluate long-held beliefs, habits and expectations. A coach provides invaluable guidance to break down and clean out these perspectives that cloud new ways of tackling problems and making decisions. result of downsizing, restructuring and mergers. talented employees in some industries. daily tasks their current jobs require that is often far removed from what they were originally trained to do. Heightened fears surrounding pressure to perform and job security create cooperate unrest. Developing comprehensive work environments that encourage collaboration to continue a high level of customer and employee satisfaction. What is the Return-On-Investment of Coaching? The universal acceptance of coaching by management for all levels of business including executives, teams and departments underscores the value of the coaching experience through proven ROI. Fortune Magazine underscores these beliefs finding that Fortune 1000 companies utilizing executive coaching saw 53% production in overall productivity, 32% increase in retention of senior personnel, 23% reduction in costs and 22% increase in bottom-line profitability resulting in an effective 600%-700% return-on-investment. Kirkpatrick’s “Four Level Evaluation Model” is the standard widely accepted for evaluating development programs. Retention-Turnover costs are often estimated to be 100%-300% of the base salary of the replaced employee. Engagement-Opportunity for learning and development. solutions and smaller group forums can lessen the cost and increase ROI.